In our last post, we talked about why your company’s culture matters. When employees can identify with a strong culture, they will be more engaged and motivated to succeed, especially as a team. In addition, they feel like they are a part of something bigger and meaningful. And best of all, they will hold themselves and their teammates more accountable, which will in turn lead to a culture of team accountability. But even more important than defining culture, we need to know what drives culture, and especially how this works with teams in the workplace. And how they influence culture. We will also explore how leaders at all levels impact these drivers and organizational culture. As outlined above, there are three main drivers of a company’s culture. Behaviors are the actions we take. Within organizations, behaviors are typically influenced by culturally based norms. And these norms are maintained by what is rewarded and punished – either directly or indirectly. Beliefs have to do with what we think will be rewarded and punished or what we believe to be acceptable or unacceptable given the culture of the organization. Experiences are what happens in reaction to a specific behavior. As it turns out, beliefs and behaviors are shaped by what is rewarded, punished, tolerated and focused on; in other words, by experiences. Here is an example of where experience drives beliefs and behaviors in the workplace: Let’s say every time someone points out a quality issue (behavior), the leader reacts by “shooting the messenger” (the experience). Thus the belief is established (by that individual and all watching) that it is not safe to raise quality issues. You can see how a company’s success could easily go downhill from this leader’s reaction to their team’s suggestions. And from this example, you can also see how leaders are largely responsible for creating experiences. And this is really good news! Because, as a leader, you are largely in control of the experiences you create. So by changing the experiences, you can change beliefs and behaviors to ones that will lead to the high-performing culture you desire. While the most frequent situation is when experiences drive beliefs and behaviors, changing behavior also drives experiences and beliefs. And changing beliefs can lead to a change in experiences and behavior. Behavior drives experiences and beliefs. 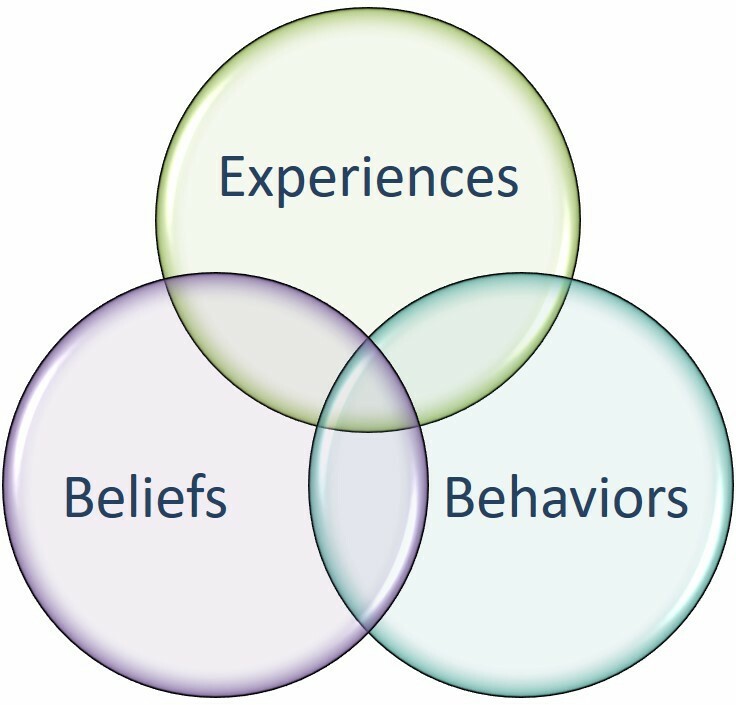 Beliefs drive experiences and behavior. Finally, let’s say someone new joins the team who believes it is their job to bring up quality issues regardless of the reaction. So they bring up issues (behavior) that can actually be solved. The experience may then change over time as the leader sees the benefit of having someone do this. As we can see from the examples above, one of the responsibilities of leaders is to create experiences that lead to team members taking the desired actions. But the leader’s responsibility in creating a company’s culture goes beyond that. Define and communicate the desired outcome. It is your job as a leader to paint the picture of the results you need and want. Develop the case for change. Changing culture, or making any major change for that matter, is hard work. Your team needs a good reason to do that work and make the change. Get staff to buy-in to the new direction. Serve as a role model, coach and mentor. In our next few posts, we will give you a road map for building a high-performance culture of team accountability that you can implement with your team. Until then, if you are ready for more solutions to motivate your teams sooner than later, get in touch with me here. Does Your Company's Culture Make People Want to Work for You? We know a company's culture is the values they stand behind, but what creates that culture? See the 3 drivers of culture and how leaders impact them daily.